MONO, ONTARIO – When you enter a bar, you may hope to leave it hugging someone. At Peter Cellar’s Pub in Mono, host Wayne Biegel takes hope out of the equation. Biegel doles out affection like some places offer snacks and the result is an atmosphere that’s as welcoming as any outside of family. Torontonians don’t have to venture far for this uncommon touch of hospitality. Peter Cellar’s Pub is beneath the Mono Cliffs Inn, a circa 1853 building with a fine restaurant on the main floor, near Mono Cliffs Provincial Park in the Hills of Headwaters area, roughly an hour’s drive northwest of Toronto. Barry O’Neill, a managing partner of the Toronto investment bank company Zed Financial, first came to Peter Cellar’s Pub seven years ago. He and his wife, Terry, were drawn to it by the quirky name, which they spotted on a road sign while on a country drive. Although the pub does feature photos of actor Peter Sellers, there’s no Pink Panther clumsiness. The food, prepared by chef Jason Reiner, is far from typical pub fare. The menu changes often but some staples include chicken liver and cognac pate, grilled calamari with sriracha mayo, baked brie in filo with a raspberry puree, a quiche with smoked salmon, spinach and goat cheese, and other options that seem more suited to a trendy urban hot spot than a woodsy area where cell-phone reception is spotty at best. The pub is one of several highlights on a daytrip to the Headwaters. The region, which includes Orangeville, Erin, Caledon, Dufferin, Shelburne and Mono, is the starting point of the four tributaries that sustained early settlements throughout southern Ontario. The Grand, Humber, Credit and Nottawasaga rivers all run through the area. Mills used to churn tirelessly in the 1800s. Today, they’re being converted. 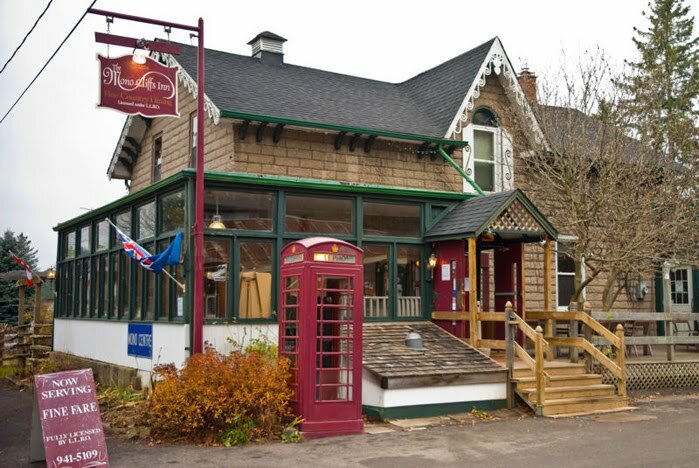 One of the most successful transformations is Caledon’s Alton Mill, with more than 20 artists’ studios and a café with baked goods shipped in daily from Guelph. The chocolate dream bar lived up to its name. The Alton Mill Creative Arts Centre is a short walk from the Millcroft Inn & Spa, long hailed for its luxury accommodation and exquisite dining. With three provincial parks, the Headwaters also attracts cross-country skiers in the winter and hikers in warmer weather. Biegel, though, says many of his visitors are Torontonians who make the drive just to stop in at the pub and then head back home. An eyecatching wine cellar made of stone is at the back of the pub. It looks like a grotto and can be booked for dining for up to eight people. But it’s up front where Biegel’s aim of getting people connecting as if they were at a dinner party seems to work. The O’Neills are world travellers who were married in South Africa last year. While they discussed their trip, Penny Light walked in only three days removed from a year-long stay in Botswana. Whether that’s coincidence or the law of attraction is for pragmatists and paranormal believers to deliberate. What Light did know was her first outing back in Ontario had to be to the Peter Cellar’s Pub. “You walk in and it feels like home. Who else gives you a hug?” she said after embracing Biegel. Directions: From downtown Toronto, take the QEW west to Highway 427 North, exit onto 401 West and then take Exit 344 to Highway 410 North toward Brampton. Highway 410 turns into Highway 10, continue on that road. Turn right onto Mono Centre Road and the Mono Cliffs Inn will be on your right. The pub is downstairs. First published in the Toronto Star.